We are the leading manufacturer of High Voltage Rectifiers and our product is made of good quality. We are the leading institutions indulged in wholesale trader & supplying a premium range of High Voltage Rectifiers. Entire range is lauded for its quality, strength, durability and performance. Our technical expertise empowers us in importing & exporting a complete range of High Voltage Rectifiers that is ideal for commercial sectors, mechanical and electronic industries. Engineered to perfection, these products are extensively used in various electronic components. Moreover, manufactured under international standards, these products are also available in varied specifications. thermal power plant: de-dusting of exhaust gases from boilers. cement plant: dust precipitation from air or waste gases, dryers & crushers, rotary kilns, etc. iron & steel: de-dusting of waste gases from blast furnaces. 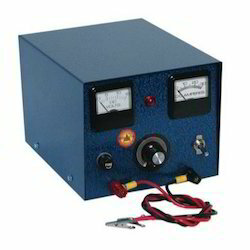 We offer High Voltage Rectifier Stack available in Voltage: 14000V, Current: 20mA-1Amp. These products are available in various designs and sizes required by out clients. To use international quality standard raw material to ensure the durability and functionality of the product. Jindal Electric & Machinery Corp.
Keeping our synchronization with the development taking place in this industry, we are engrossed in delivering a broad range of Voltage Rectifier. Applied Electrostatics And Controls Pvt Ltd.